The cell. 8. Cell cycle. Atlas of plant and animal histology. Cell cycle is a set of phases that a cell goes through during its life. It spans from the birth of the cell to the division that gives rise two new cells. The phases of the cell cycle are named G1, S, G2, and M.
G1: Cell growth. Some cells quit the cell cycle in G1, and stay in a distinct phase known as G0. S: Replication of DNA and duplication of centrosome. G2: Get ready for mitosis. Cell growth. M: Mitosis. Cell division, including chromosome segregation and cytokinesis. Cell cycle is an ordered set of phases in the life of most of the cells. Cells are born after the division of a progenitor cell, then they increase their size about twice by the synthesis of many cells structures and molecules, including DNA, and finally they divide to give rise to two new cells. This cycle is typical of cells which are proliferating. However, there are other possibilities. For example, many cells never divide, such as neurons, and some other special cells are born from the fusion of two cells, such as zygotes (fusion of two gametes), or by the fusion of many cells, such as skeletal striated muscle cells during development. Finally, some cells die. There are two major types of cells in multicellular organisms: germinal and somatic cells. Germinal cells can produce gametes, somatic cells cannot produce gametes. A germinal cell is able to produce four haploid gametes by a process known as meiosis. Proliferating somatic cells complete the cell cycle by dividing in two new somatic cells with the same number of chromosomes than the progenitor. The division of somatic cells is known as mitosis. Besides meiosis, germinal cells are able to divide in two new germinal cells by mitosis. In the next pages we will deal with the cell cycle of proliferating somatic cells. It is shown some examples of cells that do not complete the cell cycle and become long-living cells or die. Cell death may be caused by damages or it can be a physiological mechanism known as apoptosis. Cell cycle phases of eukaryotic cells. G1, S and G2 phases are grouped in a larger phase known as interphase. The cell cycle of the different types of cells of a tissue must be tightly controlled and coordinated. During embryonic development and juvenile periods, most of the cell types contribute to the animal body growth. However, once in the adult stage, the size of many cell populations remains constant, and there is a decrease or stop of the proliferation rate. The cell cycle is then adapted to the requirements of the organism, for example, for physiological cellular turnover or to repair tissue damages. Sometimes, there are some errors in some cells that do not follow the rules of the organism and divide without control. These are the cancer cells. 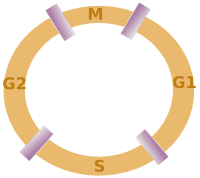 Cell cycle goes through several phases: G1, S, G2 and M (G stands for gap, S for synthesis, and M for mitosis). This sequence is present in almost every proliferating cell and only occasionally some cell cycle phases are skipped. G1, S, and G2 phases are grouped in a larger phase known as interphase. Image from the intestine epithelium where many cells are proliferating (arrows). G1 is the first phase after the cell birth. This is the largest and more variable period of the cell cycle, where the cell grows to reach the optimal size to carry out its role or continues to the next cell cycle stage. There are molecular systems in the cell that control the advance from one phase to the next during the cell cycle. They are known as checkpoints. At the end of the G1 phase, there is a molecular checkpoint that blocks the start of the next phase, S phase, unless all the requirements needed to carry out a successful S phase are accomplished. For instance, an appropriated size is needed. Not all the cells of the organisms are continuously proliferating. Many cells arrest the cell cycle in G1 in order to carry out their functions. Cells may keep doing their functions for a while and then restart the cell cycle, or they can stay in G1 phase and do not enter again in the cell cycle any more (this situation is referred as G0 phase). DNA is synthesized during S phase. This is a complex process because of the long DNA chains that form the eukaryotic chromosomes. DNA duplication must accomplish two requirements: just one copy (one replication) and make as few mistakes as possible. Any error during the replication of DNA may lead to lethal damages in the two new cells, and worse, in the organism. G2 phase is another period for cell growing, although shorter than G1. There must be enough concentration and variety of molecules that will be used during the next phase: M phase (mitosis) or cell division. 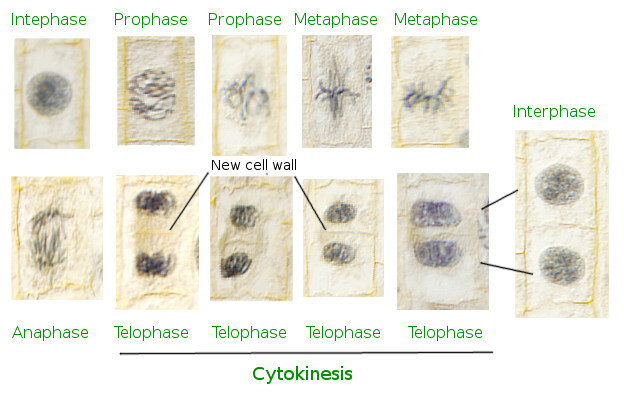 Phases of the cell cycle of plant cells of a radical meristem. Interphase includes G1, S and G2 phases. Mitosis (M phase) includes prophase, metaphase, anaphase and telophase. During cytokinesis, plant cells synthesize the cell wall that divides the cytoplasm into two new cells. Mitosis (M phase) is probably the most complex of the cell cycle phases, and an outstanding reorganization of the cellular components. In this phase, several molecular processes are triggered, and then run in parallel. Mitosis can be divided in several stages related to what it is happening to the DNA. So that it can be divided in prophase, metaphase, anaphase, and telophase. The compaction of DNA starts to occur during prophase, chromosomes are aligned in an equatorial plane during metaphase, separation of chromatids during anaphase, and decondensation of DNA and rebuilding two new nuclei during telophase. Other parallel processes are breakdown of the nuclear envelope, mitotic spindle formation, distribution of the cytoplasm components, etcetera. Cell division ends with cytokinesis or the dividing of the cytoplasm. In animal cells, an actin filament ring strangles the cytoplasm and separates the two new cells. In plant cells cytokinesis, it is synthesized a new cell wall that divides the cytoplasm in two. There are two new cells when the mitosis and cytokinesis have finished. Then, G1 phase starts again.